… and comment on our Facebook page. South Africa is at a fork in the road. As far as its socio-economic outlook is concerned, the country faces a crisis it hasn’t experienced since apartheid. Gross inequality, structural poverty and vast unemployment make our outlook unsustainable. We are sitting on a time bomb. Yet our young democracy, is maturing as it is tested. Our courts have proven to be a cornerstone, despite hesitations. For example, initially some had serious objections to the appointment of the Chief Justice, Mogoeng Mogoeng, insisting instead that then deputy Dikgang Moseneke, more outspoken and critical, should be appointed. Moegeng has not been a disappointment. Instead, what he has done is boost the legitimacy of this arm of government and citizens simply have more confidence in our top courts. However, the lower courts, with whom ordinary citizens most interact, still need improvement not only in basic logistics, such as case management, but also in transformation. Therefore while Mogoeng and his court have held the executive branch accountable, the lower courts have a long way to go before they can be seen to be acting on behalf of “The People”, as the Americans would say. Our democracy, though, is at work. Name any country in the world where a president would face his eighth vote of no confidence. Of course, some would argue, other countries would not tolerate a man, or woman, who has even reached their third vote of no confidence. On the other hand, it could raise the question whether it simply is too easy to call for it. The vote of no confidence clause, Section 102 of our Constitution, one assumes, derives from the fact that it is the National Assembly which elects the state president. It differs from an impeachment process, as set out in Section 89. The latter is far more formal and based on criteria, whereas in the former, the National Assembly simply has to vote whether it has confidence in the president or not. As mentioned, the ‘easy’ provision of Section 102 might exist because it is they, the National Assembly, who elect the president in the first place. One has yet to read why the framers of our Constitution chose the hybrid model of having the legislature elect the President, who immediately ceases to be a Member of Parliament on election, and not have a directly elected president. Even in this model, a government of national unity could have been accommodated. Or at least the current model could have existed in the Interim Constitution and the presidential one in the final Constitution. What we know is that it would have been much harder for the National Assembly to remove the President if he was directly voted in by the people. In the US, for example, where the electorate directly vote for their president, there have been only three cases of impeachment. In the case of Richard Nixon, it did not go anywhere because the minute impeachment proceedings commenced, Nixon resigned. Andrew Johnson, president from 1865 to 1869, and Bill Clinton, president from 1992 to 2000, were both saved, most probably by their parties, when it came to votes in the Senate. Clinton, unlike Johnson, had two charges against him–obstruction of justice and perjury. This week’s eighth vote of confidence against President Zuma tested our country’s democratic institutions and they proved their strength. We should not get agitated when opposition parties run to courts to hold either parliament or the executive accountable. We should rather encourage this–this is why we have the principle of separation of powers. When there is a continued call for a vote of no confidence we must embrace it as one of our democratic instruments for holding the executive accountable. The Speaker of the National Assembly, Baleka Mbete ruled the day before the debate that the vote would be in secret, against all expectations. Despite this, as we saw, President Zuma was saved to see another day in office. He must be assured, though, that with a vibrant democracy, he will have to face off with an opposition again, either in Parliament or in our courts. As he prolongs his days in office, these will only get stronger. 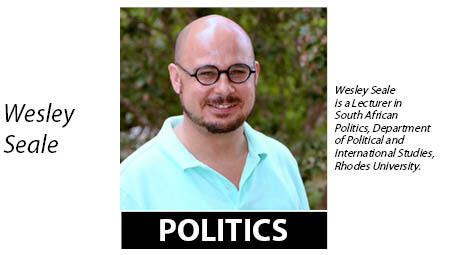 * Wesley Seale is a Lecturer in South African Politics, Department of Political and International Studies, Rhodes University.